In April 2014, Governor Cuomo of New York kicked off the New York Reforming the Energy Vision (NY REV). This encompasses multiple dimensions of regulated administrated programs, regulatory reform and new institutions – all of which work together to create an enabling environment for a transition to a sustainable energy future for New York State (NYS). The administered programs include support for renewable energy (including solar in particular), for energy efficiency, for vulnerable customers and energy affordability, for electric vehicles and so on. The new institutions includes a Green Investment Bank. At the same time, the New York Public Service Commission (PSC) initiated a regulatory reform aspect of the Reforming the Energy Vision (REV) with a regulatory Order in April 2014 from the Commissioners of the PSC to ‘transform New York State’s industry with the objective of creating market-based, sustainable products and services that drive an increasingly efficient, clean, reliable, and customer-orientated industry’. NY has a comprehensive NYS Energy Plan (SEP), which fits into the US Clean Energy Plan. The NYS Energy Plan (SEP) has Greenhouse Gas (GHG) targets for a 40% reduction from 1990 levels by 2030 (and by 80% by 2050); and their energy targets are to generate 50% of electricity from renewables by 2030; and to reduce energy consumption in buildings by 23% by 2030 from 2012 levels. IGov blogged on this regulatory reform aspect in the summer of 2014 and then provided an update in the summer of 2015. This blog is to update where the NY REV regulatory reform has got to since then because of a Ratemaking Order which was published on 19 May 2016 (a Notes powerpoint can be found here). For the first time, we now know what the NY distribution utilities are expected to transform to, and what their sources of revenue are expected to be. This blog works on the assumption that it is being read by those who already know what has happened so far in the regulatory reforms of NYS. For those who are reading about the NY REV for the first time, please read my summer of 2014 and summer of 2015 blogs and a blog on Distribution Service Providers – these will give you the necessary background. There are also several blogs on transformative governance (for example, here and here), which include discussion of the NY REV and the degree to which a DSP may be a transformative governance mechanism. Moreover, IGov had a workshop on the Distribution Service Providers (DSP): a transformative energy system institution? and the presentations are available here. This is a fundamentally different (energy and) regulatory paradigm from those in place across the US. 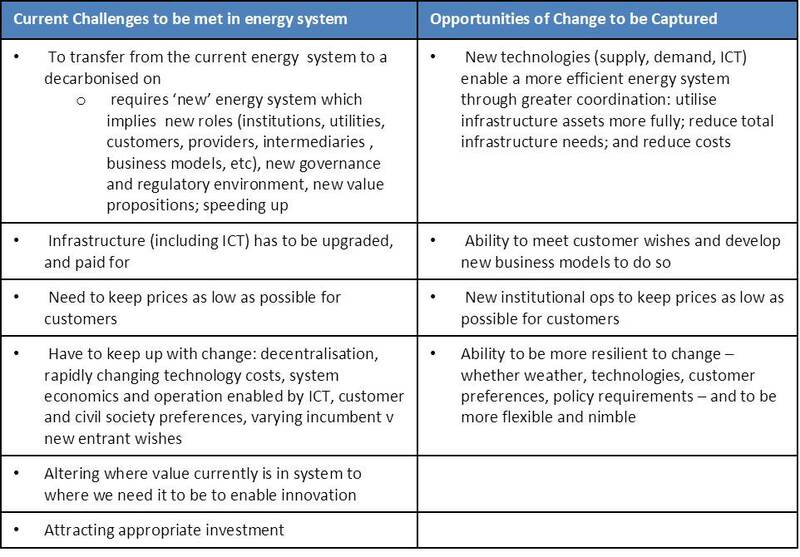 Whilst it envisages an evolutionary transition to it, the Vision is setting out ‘an end point’ it expects to get to – which is a smart, primarily decentralised, market-based energy system. The NY REV argues that the current business-as-usual regulation cannot deal with the current challenges that energy systems face, nor can it capture the available opportunities. The NY REV argued for a new value proposition, and for transforming ‘passive’ distribution network operators into ‘active’ distribution service providers – which are market facilitators. The idea of the DSP is that the utility is regulated in such a way that it incentives new behaviours, or animation, of the DSP itself, its customers and its service providers. The basic argument is that if a distribution network company is regulated in such a way that its incentives relate to increasing capital (ie rate of return on assets or capital revenue on units transferred across their network) then it will maximize those incentives. If a regulator wants them to act in another way, then the distribution company incentives should be related to that new role. For example, if one required output is improved energy system efficiency then the utility should be incentivized to deliver, for example, an improved rate of utilization of assets; reducing the cost of peak energy. 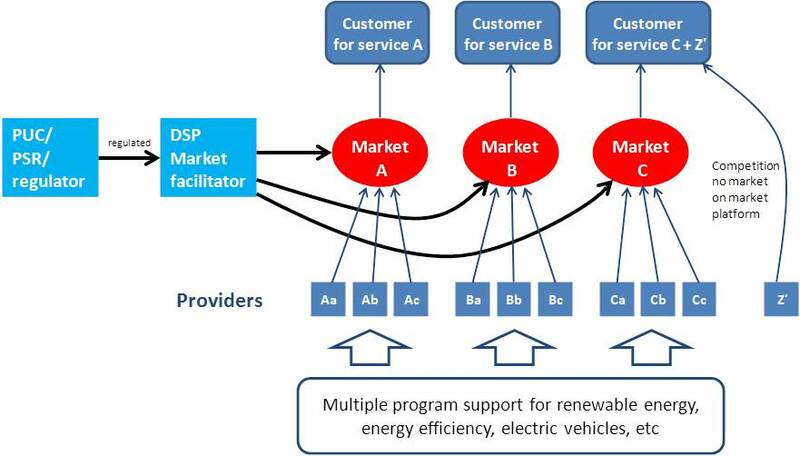 The DSP is envisaged as both the local System Operator and as the platform through which third-party providers of distributed energy resources (DER) can sell to customers (of all types) via new markets to create value for both customers and the system. The DSP is to serve as a multi-way retail-level dispatcher to the grid (distribution and transmission) of both energy and system services, supplied not only by traditional power plants, but also by a vastly expanded fleet of Distributed Energy Resources (DER). These resources are defined as including end-use energy efficiency, demand response, distributed storage, and distributed generation. 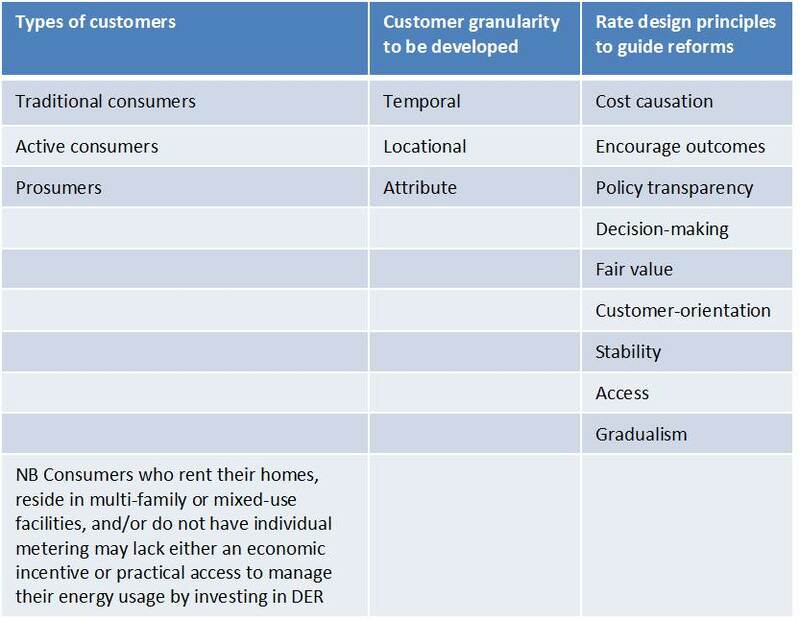 The DER will principally be located on customer premises, but may also be located on distribution system facilities – under a very clear set of criteria. On the whole, the DSPs are expected to be facilitators and co-ordinators. If they want new services, then they provide incentives or stimulate tariffs (and necessary data and analysis) to enable a third party to provide it. If customers want to do something, then that either occurs under ‘normal’ market situation or the DSP will enable a value chain so that it can occur as a regulated market. It is not the intention of the PSC, that the DSPs become owner / operators of DER or to provide system services, except under very particular criteria. DER is supported via the various administrated programs, as shown in a conceptual figure of a ‘generic’ DSP in Figure 1 below. Figure 1: What is the generic DSP model? The intervening two years since the start of the regulatory reform aspect of the NY REV has seen multiple documents published (Orders, Green Papers, White Papers) discussing different aspects of the NY REV. 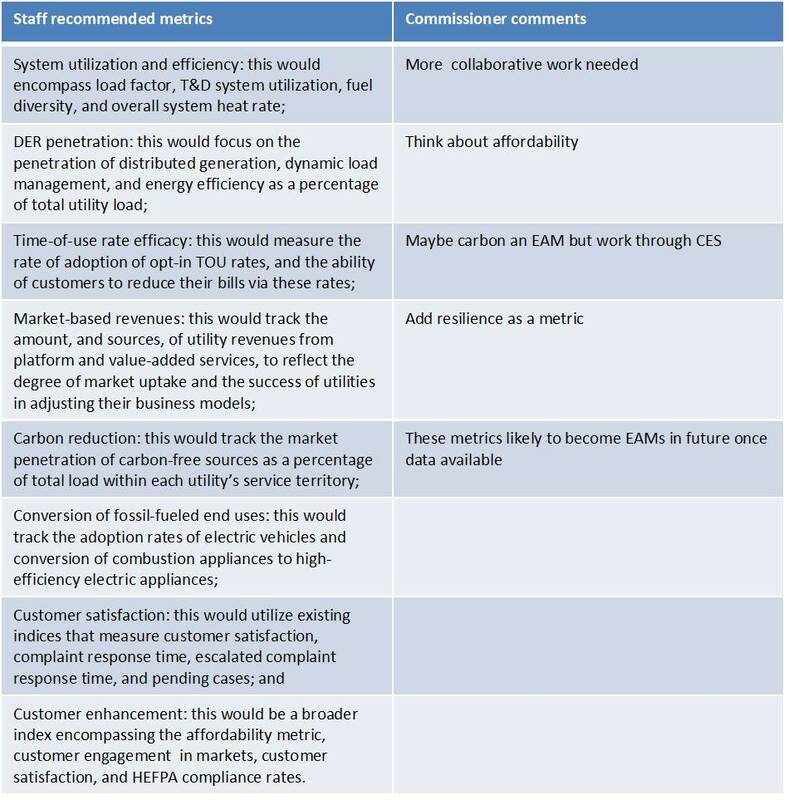 On 19 May 2016, a White Paper on Ratemaking was published which sets out the different ways that utilities will be expected to make money in the future, and the timelines for doing so. Overall, there is a large difference between the Vision as set out in the intervening documents, and the actual changes set out in the Ratemaking Order. Figure 2 shows the sources of revenue set out in the Ratemaking Order. Revenue from Traditional cost-of-service regulation continues, and there are a number of reforms to this, for example concerning stand-by tariffs which enables a new source of revenue. There are then two wholly new areas that the DSP is expected to make money from. 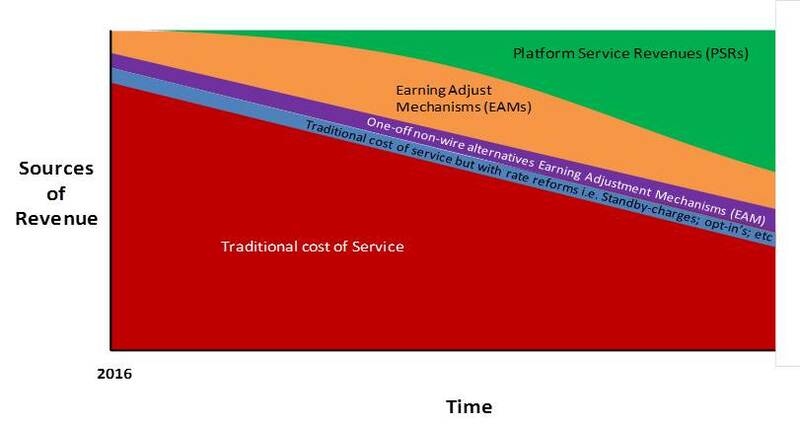 The first new major area of revenue is is via performance based regulation on Earning Adjustment Mechanisms – and these EAMs are mechanisms which are necessary for a well functioning distribution service platform model. 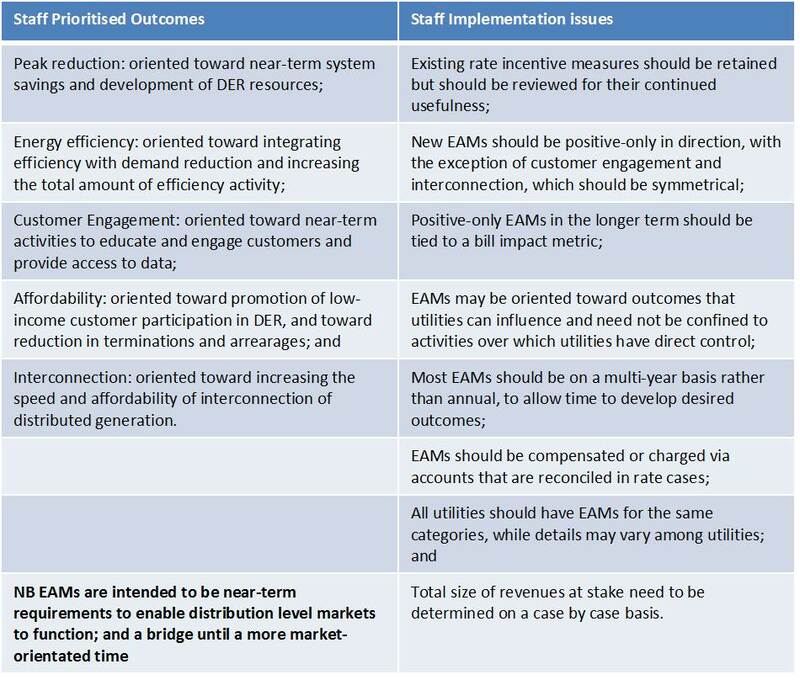 The EAMs (see Table 2 below) include incentives to improve energy efficiency and grid utilisation, to bring down peak costs, to increase the numbers of 3rd party energy service providers, to meet State energy policies, such as increasing renewable energy percentages and so on. NYS has multiple administered programmes to complement and enable the EAMs – for example, a Clean Energy Standard which supports renewable energy; energy efficiency via a Clean Energy Fund (CEF, CEF Order) and an Affordability policy. These programmes encourage DER. The combination of the EAMs, and the administered programmes for DER essentially provide the building blocks necessary for the second area of revenue discussed below platform service revenues, made from market transactions. Those markets can only develop if DER is available. Thus, the NY REV should be envisioned as a combination of dimensions which together provide an enabling environment for, one hopes, successful regulatory reform. Overall though the EAMs should not add more than 2% of their delivered revenues to the distribution companies in the first phase (ie over the next 3 years). Given that current performance based regulation is related to slightly less than 6% of total delivered revenues in NY, this takes PBR up to about 8%, which is a very small change. In addition to EAMs, there is a series of areas which will have data collected about them. These are known as the Scorecard areas, and these areas (as shown in Table 3) are expected to become EAMs. Overall therefore, it is intended that the PBR proportion of total revenue grows significantly over time. The second major new area of revenue reform is from Platform Service Revenues (PSRs), and these are related to the market transactions of the DSP. It is anticipated that there will be a payment for each market transaction replacing (to some extent) the current distribution utility payments from each unit transferred across its wires. The latter gives the distribution utility an incentive to supply. The idea is that the combination of the incentive from the PBR via EAMs and the incentive from the transaction payments in PSRs will give the DSP a dominant incentive to be a platform service company providing services which both customers want but which also fulfil the State policy objectives and at lower cost to customers. This PSR area of revenue will develop after the EAMs have got going – because they effectively are the necessary building blocks of a transactive DSP. In addition, there will be rate-design reform which is intended provide both the DSP and customers with incentives to become more ‘active’. 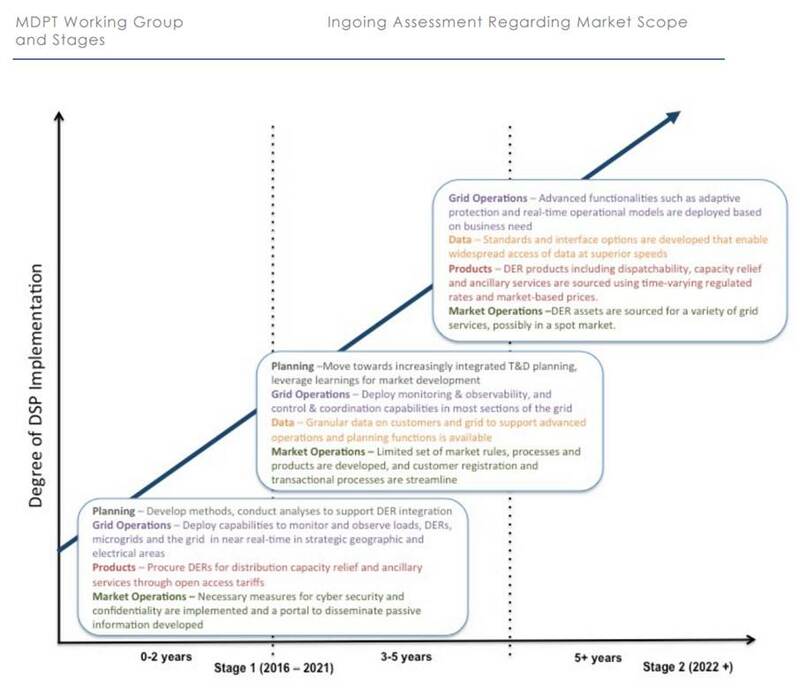 The timeline for this is over the next decade or so, according to the Market Design and Platform Technology Report (MDPT Report), published in August 2015. See Figure 3 below. The NY REV is at the beginning of its Vision to transform the institutional basis, incentive structure and operation of the NY energy system. Up until the 19 May 2016 Ratemaking Order, the language of its previous Orders and Papers has been radical. The Order has set out a very different future. The distribution utilities are expected to change where they get their revenue from in a very fundamental manner over the next decade. Moreover, the Order provided a clear understanding of how the various dimensions interlock with each other ie the regulated administered programs, the EAMs, the PSR, the timeline. This is not just a little bit of performance based regulation – this is a full scale regulatory restructuring over a decade or so from a cost of service mechanism where the distribution companies makes money on each unit sold to a distribution service provider which makes money NOT on units sold but from PBR and platform transactions. Its first ‘real’ steps which effect day to day revenues, as set out in the Ratemaking Order, has been more limited than expected. This has been greeted as ‘realistic’ by some. Others may have hoped for more. Nevertheless, all recognise that the expectation of revenue sources over the next decade is a transformation of the energy system in NYS. An Order is a formal decision by the PSC Commissioners; A ‘Staff’ Report is written by staff of the PSC. Comments on the Staff reports are made by stakeholders. The Commissioners take both the staff report as well as the stakeholder comments into consideration before announcing an Order.